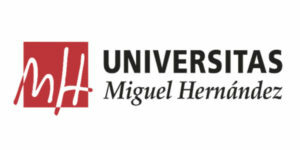 It is offered by the University of Piemonte Orientale (UPO; Italy), the University Miguel Hernández (UMH; Spain), the University of Namur (UNAMUR; Belgium), and Humboldt University (HU; Germany) via a collaboration with Charité Universitätsmedizin Berlin. Each of the four Universities contributes to its field of excellence with complementary expertise that covers the main aspects of this interdisciplinary field. UPO will be responsible for the teaching of basic knowledge, of the R&D process and of early drug discovery; UMH will integrate the education of the students with knowledge on preclinical drug development, while UNAMUR and HU will integrate the knowledge on clinical drug development. The program structure makes use of a blend of teaching approaches and includes teaching from non-academic professionals to convey practical, timely information. Furthermore, the program fulfills both students’ and employers’ needs in terms of job-seeking, entrepreneurship and project management skills. EMOTION trains the next generation of R&D leaders in the dermatological and derma-cosmetic field, but at the same time provides sufficient know-how to allow graduates to work in other pharmaceutical and cosmetic R&D sectors. It is envisaged that most graduates will work in pharmaceutical industries or in cosmetic industries carrying out R&D programs. Both fields are economically important and are expanding, as there is a constant need for innovation in drugs and cosmetics. Health and well-being, including healthy aging, are priorities in the modern world. Importantly, the master intends to stimulate students towards entrepreneurship, and thereby develop their own businesses. The aggregate market for medicines and cosmetics in the world is over two trillion euros, 10% of which is solely for skin disorders, demonstrating excellent prospects for employment, entrepreneurship and personal gratifications. The Master will be structured in three one-semester long teaching modules in two of the three institutions, allowing for students to choose in the third semester whether their intellectual inclination is towards preclinical or clinical research and in three thematic workshops focused on transferable skills. In the last semester, a personalized program will bring the student to perform her/his thesis work either in industry or in academia. A generous number of scholarships, for both European and non-European citizens, are provided by the European Commission. Students that will not be eligible for the scholarships will nonetheless be allowed to participate in the program provided they meet the merit requirements. two semesters in Italy and one semester in either Spain or Belgium, according to whether the intellectual inclination of the student is towards preclinical or clinical research. Basic, background information will be provided by University professors, but testimonials from the productive world will be heavily relied upon to provide up-to-date and valuable information to transit to the industrial environment and to make an impact in the R&D arena. All semesters also include practical work. Depending on the semester and the option taken by the student, practicals will be in synthetic and extractive chemistry, pharmaceutical technology, biotechnology, pre-clinical and clinical pharmacology. three thematic workshops focused on transferrable skills. The workshops will be mainly conducted by professionals transmitting hands-on experience on specific topics and will be the occasion to create a network with the productive sector. Indeed, representatives of the pharmaceutical and cosmetic sectors will also attend these workshops. The three workshops will be on the description of the reference markets, on communication and job seeking skills and on the development of their entrepreneurship skills. The workshops will also be the culminating moment for project work that has been carried out during the previous semester. a six-month research project either in academia (including Humboldt University in Germany) or industry. The project will be mentored by one of the staff of the Master but the activities will be tailored to the ambitions of the student, and will therefore be carried out either at one of the four Universities, in a different University or in industry. The work carried out will be the subject of the thesis that the student will be expected to write and discuss for his final degree. 1. Anatomy and physiology of skin and appendages. The students will learn anatomy and histology of skin and appendages and the physiological mechanisms regulating the intergumentary system. 2. Pathological mechanisms of skin disorders. The students will learn the basis of mucosal immunity, the pathogenesis of inflammatory skin disorders, either autoimmune disorders or allergies, and the cellular and molecular mechanisms underlying wound healing. The students will also gain knowledge on the physiological microbiota of skin and on the principal pathogens associated with skin diseases. 3. Statistics, data retrieval, data mining and epidemiology. The students will gather basic information on statistics for the biomedical sciences, will be taught how to retrieve, categorize and use information both in a supervised and unsupervised manner. This will include the know-how to perform systematic reviews of the literature and meta-analysis as well as the basic principles of epidemiology to understand the therapeutic need. These topics will be consolidated through examples and computer exercises. (i) Introduction to the general principles of R&D and translational skills (including project management, decision making, communication skills, intellectual property, trademark protection and good practices). (ii) Organic Chemistry. The students will be introduced to the main functional groups and heterocycles, their electronic properties and reactivity. Selected examples of synthetic routes to pharmaceutical and cosmetic compounds will be illustrated. (iii) Natural products. What is a natural product and how to distinguish natural products from their synthetic version? Plant natural product biosynthesis. Plant biotechnology to produce natural products. Terpenes, alkaloids, flavonoids. Aromas and fragrances. (iv) Protein Science and biotechnology. The course will provide the rudimental of biotechnology and protein science and elaborate around the central concept of protein structure-function relationship. Selected biotechnological techniques used in protein science will be reviewed and examples of proteins of pharmaceutical interest for translational cosmetic and dermatological science will be presented. 5. General principles of drug and cosmetic regulation. This unit focuses on the main issues regarding regulations and the distinction between the pharmaceutical and the cosmetic world and the different geographical regions. (i) Pre-clinical and Clinical Pharmacology. The course will illustrate the drug discovery process from a pharmacological perspective and will provide students with notions of the main drug classes. The course will also provide students with the ability to read and critically analyse pre-clinical and clinical data. (ii) Medicinal Chemistry. The course will provide the students with the basic principles for the discovery and optimization of a bioactive compound, from hit to lead, with a focus on drug metabolism. The design of prodrugs and softdrugs for topical use will be covered. Examples of successful stories of dermatological drugs will be presented. (iii) In silico drug discovery and design. The course will illustrate the many ways we can describe, represent and visualize molecules in the computer, the importance of recognizing and understanding the concept of similarity and the physicochemical and topological descriptors. The students will learn the use of 3D Quantitative Structure-Activity Relationships (QSARs) approaches as an example to correlate molecular structures with their known biological endpoints. The In silico optimization of new molecular entities to enhance potency against the enzyme-binding site of interest will be illustrated. (iv) Principles of drug formulation. The course will provide students with basic principles of formulation, illustrating how physical pharmacy principles are applied to the preparation of liquid and semi-solid dosage forms used for topical application of medications and cosmetics (creams, ointments, gels, colloids, patches and sunscreen formulations). 2. Principles of dermatological symptoms and of skin aging. The students receive knowledge on the dermatological symptoms, and the clinical features of disorders, including skin photo-ageing and photoprotection. The course will highlight the current unmet medical needs. (iv) the key areas of quality control of cosmetic and dermatological products, including chemical and physical analysis (e. g. liquid chromatography, Uv-Vis spectrophotometry), product stability and factors influencing the storage and shelf-life. 1. Cosmetic and dermatological products on the market; from molecular biology to market. At the end of the course the student will be provided with the principles for developing bioactive molecules into products based on solid science that includes the use of biotechnology-derived ingredients, genetic profiling for individual skin-care, stem-cell-based products and therapies to regenerate ageing tissues, or cell and tissue engineering. In addition, the course will also concentrate on market penetration, value proposition and value development of products. 2. In vitro skin models for testing and evaluation. The main aim of this course is to provide the knowledge necessary to design, develop and validate bioactive compounds from library screenings to cosmetic and dermatological applications to obtain effective and stable products for exploitation. At the end of the laboratory, the students will be familiar with the most up-to-date cellular and multicellular in vitro models employed to assess the efficacy, safety, and mechanism of action of bioactive molecules and other ingredients. 3. Safety Evaluation. The course will address potential off-target effects as well as knowledge on how to perform safety assessments and toxicological profiles of cosmetic and dermatological products, evaluating the risks of their application to healthy human skin under normal and foreseeable use conditions. 4. Pre-clinical regulatory and quality compliance issues world-wide. The student will be provided with the main laws and regulations for cosmetics and drugs for exploitation, including good laboratory and manufacturing practices, requirements for registration, and labelling. 5. Scientific skills in preclinical studies. The student at the end of the course will be able to cope with the scientific literature and with writing a scientific paper, divulgate and marketing skills. 1. Clinical trials. The student will get an overview of the entire process of Clinical Drug Development. The current rules and regulations are explained and put into a historical perspective. The course will teach how the different actors are involved in clinical drug research, about the respective roles and the way they interact between one another. Through some practical exercises and visits to phase 1, CRO and pharmaceutical companies, the student will have a better insight on how medications are distributed, stored and administered to subjects, how the coordination in Clinical Trials Centres occurs and what the different source documents look like. The course will discuss some ethical questions, new trends in Clinical Development, innovative ways to recruit subjects in Clinical trials, adaptive designs, concept of Lean and the latest trends in Clinical research. It will also tackle the new European Regulation on Clinical trials. 3. Bioethics. This course will illustrate the ethical requirements for the conduction of clinical trials in contemporary science, also giving an overview of historical pillars that brought legislations and opinions to change. 4. Clinical study management. This course puts emphasis in the practice of the theoretical concepts. The role of clinical study manager will be explained. Applicable software system used by biotechnology and pharmaceutical industries will be explained as well, with focus on planning, performing and reporting functions, along with participant contact information, tracking deadlines and milestones. The course we highlight the following topics: efficient recruitment of trial participants; the importance of education and experienced study personnel; publication of trial results and dissemination. 5. Clinical research associate training. The course will provide students with the basic training required for clinical research associates. The course has the added value of allowing students to undertake an internship in a clinical research organization according to EU legislation, if in their will. 6. Clinical project management. The students will be introduced to the role, skills and responsibilities of a Clinical Project Manager (hard skills, soft skills and how to optimize clinical trials). 7. Biomarkers, biobanks, personalized medicines. The students will be introduced to the definition and the relevance of biomarkers. The program of this course provides key elements on the use of biobanks for the development of research projects, including legislation, ethics rules and requirements in terms of quality of the samples used. At the end of this course, students will be taught the advantages and issues of setting up a personalized medicine. 8. Project management: development of biomarkers. Regulatory aspects linked to the development of biomarkers are addressed in depth. 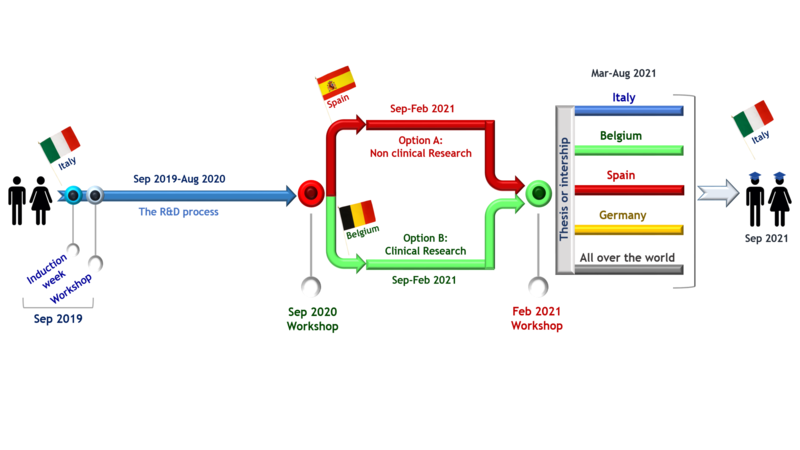 Several research projects are presented to illustrate: the upstream steps to the experimental work; the diversity of experimental approaches that can be taken on. Size, characteristics and peculiarities of the dermatological and cosmetic markets. This workshop will introduce students to the pharmaceutical and cosmetic industry, the main areas of investment of companies as well as to the world of marketing. Dedicated lectures on marketing strategies, social communication, digital commerce and social data enrichment will be delivered alongside lectures that illustrate size and characteristics of the different markets. Communication and Job Seeking Skills. At the end of the workshop participants will be able to set up and manage a personal strategy for job searching. The intensive programme provides participants with the insights and skills to: (i) understand and explore recruitment tools and channels; (ii) improve their understanding of personal proposition; (iii) develop a more strategic approach to job searching and networking; (iv) plan a process to manage career step; (v) better understand and use the principles of human resources relations; (vi) practical exercises. Part of the time will also be reserved to the presentations by students on their Case Study. Business Plan and Entrepreneurship. The students will receive lectures from non-academic professionals relating to the ideation and construction of businesses centred on cosmetic and pharmaceutical products, with examples of success stories as well as failures. Part of the time will also be reserved to the presentations by students on their Business Plan and on their Clinical Trial. Case Study and Project Management (First year, second semester). The course will run with tutors. Students will be given a cosmetic or pharmaceutical product and they will need to explore: (i) the biological potential; (ii) the marketing potential; (iii) the literature that supports any claims; (iv) to propose a strategy for marketing the product; and (v) to provide R&D programmes for follow-on products and for life-cycle management. The course will also use flipped classroom techniques by which students will be required to work in teams. The Case Study will be presented by the students during one of the workshops. Starting up a company: the Business Plan (Second year, first semester, Option A). Students, working in groups, will be required to develop a business plan for a potential new company they would like to set-up around their interests. They will receive tutoring on the scientific and business aspects of the project. The project will culminate at the end of the semester during one of the workshops in a pitch delivered to non-academic professionals that will play the role of investors. What is intellectual property and how to protect it (Second year, first semester, Option A). The students will learn the conditions for discovery, intellectual property rights and patenting. The structure of a patent application will be reviewed and concepts such as objective novelty, priority principle and inventive step will be reviewed and illustrated with examples. Emphasis will be on principles and strategies in connection with preparing patent applications, with weight on types of requirements and their formulation. Various illustrative case stories will be reviewed and worked on in groups, and students will then present their results. A case study of clinical trial (Second year, first semester, Option B). Students will be asked to design a clinical development (Phase I, Phase II, and Phase III study) for a drug which has just completed pre-clinical investigations. Students will be divided in small groups (2-3). The Case Study will be presented during one of the workshops. During the fourth semester, Students will complete an elective project in industry or at a research laboratory. The traineeship lasts 22 to 26 weeks. EMOTION trains to become a professional in the pharmaceutical or cosmetic field, both in the private or public sector. A Bachelor degree or higher from a recognized academic higher education institution (equivalent to a European undergraduate degree of 180 ECTS – 6 semesters) in a field related to the EMOTION area (for example Pharmacy, Medicine, Biology, Biochemistry, Chemistry, Pharmaceutical Sciences, Biomedical Sciences, Genetics, Molecular Biology). The grade average of the previous study should prove a high qualification of the applicant. These are the only tests accepted as proofs of English proficiency. Any other type of diplomas is not considered as valid proof of English proficiency. Candidates are responsible to meet the visa requirements for the countries in which each host institution is located, although the Masters’ secretariat will provide advice. 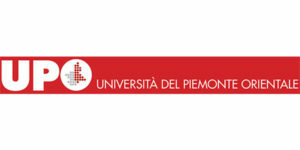 The application process is organized at the University of Piemonte Orientale. You must upload all required documents in the University of Piemonte Orientale online application system. All the required documents are submitted electronically. When you apply you need to attach a single PDF file of less than 50 MB, providing all the required documents in the order specified here. Only complete online applications are eligible and can be assessed. Our online application platform opens on February 1st, 2019. All applications must be submitted through our application platform by February 28th, 2019. EMOTION offers enrolment to European residents that have not participated in the application for an EMJMD scholarship. Applications will be received between May 2nd and June 28th, 2019. Selected applicants will be notified by e-mail by July 15th, 2019. In order to be enrolled to EMOTION, admitted students, except for EMJMD scholarship recipients, have to pay participation costs at the University of Piemonte Orientale. The participation costs for 2019-2021 are € 4,500 per academic year (€ 9,000 in total). Participation costs only cover administrative fees and the academic costs of the program. They do not include costs for living, housing, and travel. 15 Erasmus+ EMJMD EMOTION scholarships are available that fully cover the tuition fee and also cover travel, installation and subsistence costs. These are available to both European and non-European citizens and are awarded solely on merit.